Does a glass of ice water filled to the brim overflow when the ice melts? Does the energy inside a sauna increase when you heat it up? What's the best way to cool your coffee—adding the creamer first or last? These and other challenging puzzlers provide a fresh—and fun—approach to learning real physics. Presenting both classic and new problems, Brainteaser Physics challenges readers to use imagination and basic physics principles to find the answers. 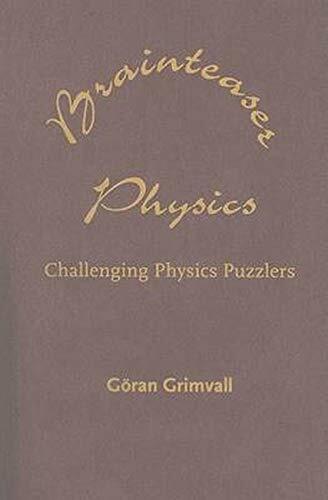 Göran Grimvall provides detailed and accessible explanations of the solutions, sometimes correcting the standard explanations, sometimes putting a new twist on them. He provides diagrams and equations where appropriate and ends each problem by discussing a specific concept or offering an extra challenge. With Brainteaser Physics, students and veteran physicists alike can sharpen their critical and creative thinking—and have fun at the same time. Provides a fun, casual approach to learning the science of physics... Perfect for high school or general-interest collections seeking reinforcements to physics principles. A good mix of problem types... Highly recommended. General readers; lower- and upper-division undergraduates. Instructors could use Brainteaser Physics in a variety of ways... The book is also recommended just because it is entertaining to read. 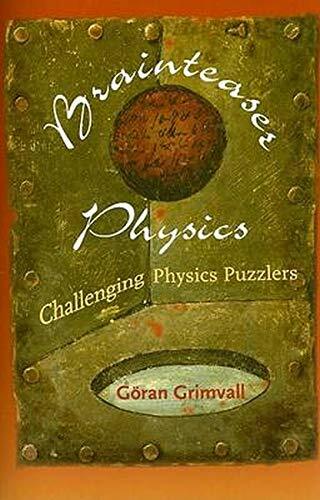 I found it hard to put down... A useful resource for Physics teachers and lecturers. The puzzles are interesting, and the explanations and mathematics very clear. Göran Grimvall is a professor of physics and the director of undergraduate studies at the Royal Institute of Technology, Stockholm. He is an elected member of the Royal Swedish Academy of Engineering Sciences and has published several popular science books.